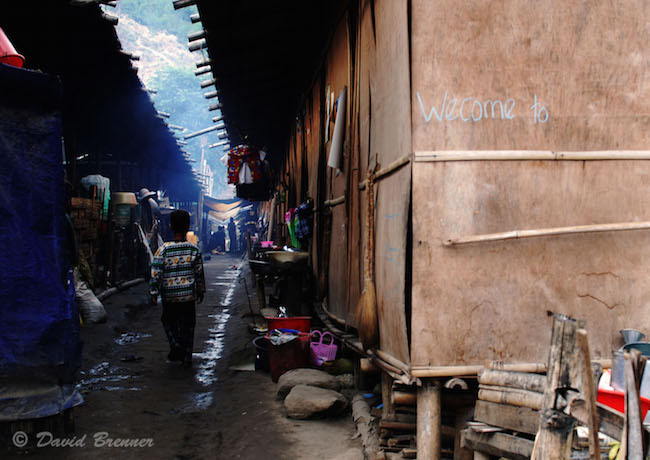 This week, a new photo exhibition opened at LSE with images taken by Hkun Lat, Hkun Li and David Brenner portraying the everyday lives of people in Burma’s conflict-ridden Kachin State. In this photo essay David Brenner offers selected images from the exhibition and an insight into their context. The exhibition is open Monday 13 April – Friday 8 May 2015 (10am-8pm, Mon-Fri) in the Atrium Gallery of LSE’s Old Building. Entry is free. The political landscape of Burma has changed rapidly since former dictator Than Shwe paved the way for a series of wide-ranging reforms in 2011. A nominally civilian government was sworn in and many political prisoners were freed, including long-term opposition leader Daw Aung San Suu Kyi. After decades of authoritarian rule, the lives of many Burmese seem to have improved. Sadly, this is not necessarily the case in Burma’s borderlands, which are home to the world’s longest ongoing civil war. Many parts of these inaccessible upland regions are inhabited by a mosaic of ethnic minorities and have never fully succumbed to state control. Whereas Burma’s kings maintained a complex relationship with upland authorities, British colonial administration divided the country into ‘Burma Proper’ and ‘Frontier Burma’. While the former was governed directly, the latter’s affairs were largely left to local chiefs. At the same time, upland minorities were drafted heavily into the colonial armed forces, the primary tool for oppressing growing domestic dissent and nationalism among the ethnic Bamar majority. The geopolitics of the Second World War further pitched different ethnic groups against each other. Bamar elites fought alongside the Japanese in an attempt to rid themselves of the British. Many ethnic minorities stayed loyal to the Allies. 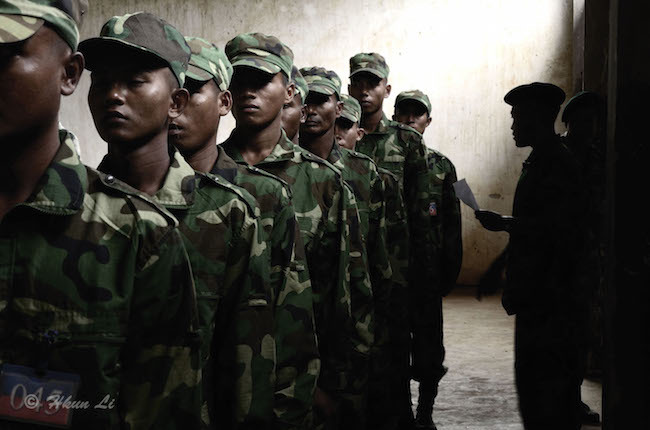 A photo exhibition at the LSE Atrium offers rare insights into the struggle of local communities in a conflict that largely remains off-limits to international observers. It sheds light on the lives of young KIA rebels on the front line, the suffering of civilians in the IDP camps with only minimal international aid, the rampant extractive economies that have complicated the conflict further, as well as the day to day experiences of civilians living under rebel rule. The Kachin Independence Army (KIA) was founded in 1961 by Kachin veterans of the Second World War, university students and local elites in reaction to repressive state policies that discriminated against ethnic minorities. Since then it has enjoyed significant sympathy among local communities. With the resumption of fighting in 2011, a new generation has joined the KIA insurgency, which currently fields approximately 10,000 fighters. While old veterans also participate in the recent campaign, many hilltop trenches are filled with young adults. Having grown up in a militarised environment, where marginalisation is prevalent and prospects for the future are scarce, many Kachin students have swapped their textbooks for Kalashnikovs. A solution to the conflict will not only need to address issues of power sharing but also needs to incorporate inclusive socio-economic development that allow for the reintegration of a disillusioned generation into civilian life. Journalist and Burma old-hand Bertil Lintner called Kachin State the “Land of Jade”. Besides jade stones, the area is rich in gold and timber. A ceasefire agreement that lasted from 1994 to 2011 stabilised the area to an extent that enabled Chinese and domestic companies to exploit these riches on an unprecedented scale and pace. The Harvard Ash Center estimates that $6-9 billion worth of jade was shipped out of the country in 2011 without being recorded, mostly to China. The KIA funds its insurgency by taxing these companies and related border trade. Smaller militias in the area grow poppy to sustain themselves. This has also resulted in the wide-spread use of heroin, particularly among miners working in abysmal conditions. 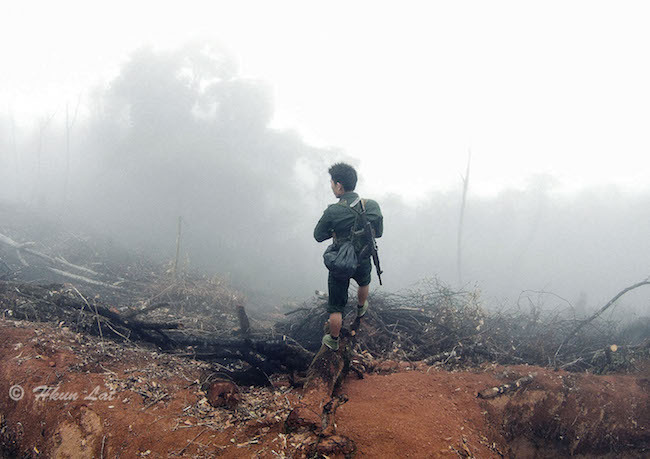 In addition, unsustainable extraction methods – including the heavy use of mercury, TNT, and large-scale deforestation – have taken a heavy toll on local communities and their environment. All this has given rise to new grievances in Kachin State. Since heavy fighting between government forces and the KIA broke out again in 2011, more than 120,000 civilians have been forced from their homes. Most have fled the advancing Burmese army and sought shelter in KIA controlled camps. Government and KIA figures on the exact number of internally displaced persons (IDP) in rebel controlled camps vary between 80,000 and 100,000. These figures are difficult to verify as the government does not allow international aid organisations to operate within rebel held territory. While the camps are administered and part-funded by the KIA, the IDPs mostly depend on community based organisations, including local humanitarian NGOs and churches. The situation of these makeshifts camps is nevertheless dire: malaria and cholera are endemic, a cheap supply of heroin has fuelled an HIV/AIDS outbreak, and women and children are increasingly at risk of human traffickers. During the ceasefire the unofficial capital of the KIA, Laiza, developed into a relatively prosperous trade hub with China. In this small border town, many Chinese opened shops. They also brought a well-known entertainment industry, including casinos, karaoke bars and video gaming shops. While the displaced have to bear the brunt of war in overcrowded makeshift camps, the return to conflict has also impacted the inhabitants of Laiza. 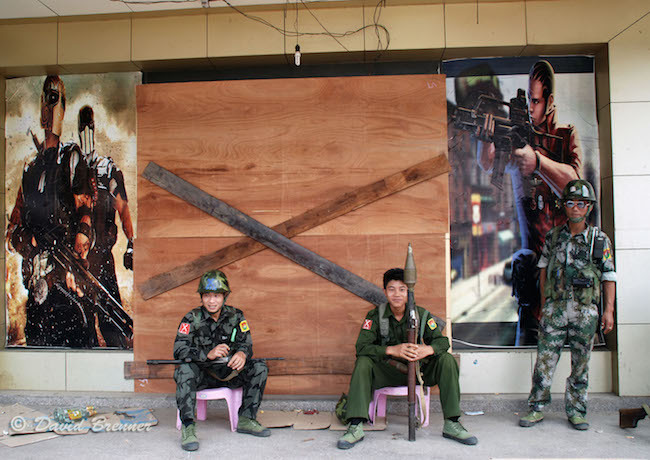 Today doctors and nurses try to cope with limited supplies in the rebel-run hospital, tailors have switched to producing military uniforms, the entertainment industry is largely closed, rebel policemen are patrolling half deserted streets, and buses cannot run through the frontline to the rest of Burma. Yet, life goes on. Couples marry and children learn how to play the violin, in the hopes of a brighter future. The exhibition is a collaboration between Hkun Li and Hkun Lat, two local photographers, and David Brenner, a PhD Student at LSE. Hkun Li and Hkun Lat are two young brothers from Kachin State in Burma, where they grew up in the provincial capital Myitkyina. Both developed an early passion in photography and mostly taught themselves on borrowed compact cameras. Although their home town was largely spared from recent fighting, the reescalation of armed conflict since 2011 has unsettled their youth at the age of 15 and 25. Deeply moved by the dreadful stories from fleeing civilians, they began to use their photographic skills to communicate their surroundings to the world. David Brenner met them on field research in the area. Hkun Li has largely taught himself photography but also received some formal training with the Documentary Art Asia satellite center in Kachin State, for whom he has worked as an instructor since. 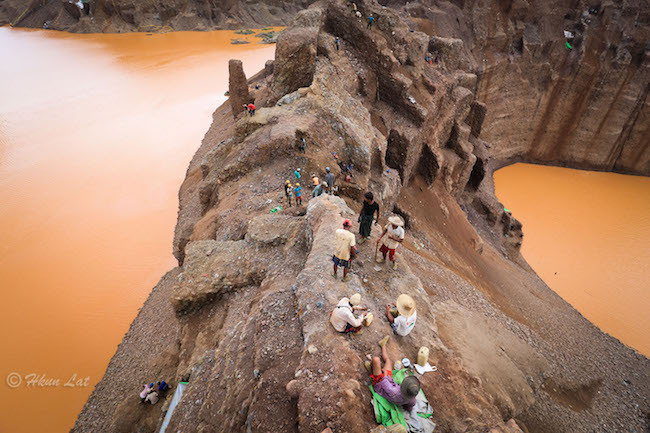 In 2014 he won the third prize at the Yangon Photo Festival (YPF) organized by the Institut Français de Birmanie. View his portfolio here. Hkun Lat has largely taught himself photography with sources from the internet and participated in a workshop organised by the YPF. In 2015 he won the second prize at the YPF. He has freelanced for various local newspapers and now works as a photojournalist for the local Popular News Journal. View his portfolio here. David Brenner is a doctoral candidate in International Relations at the LSE and uses photography as a means to communicate his research to a wider audience. He travelled extensively in the area his field research on the conflict. He tweets @DavBrenner. This exhibition is in association with LSE Arts. It is generously supported by the International Relations Department at the LSE.